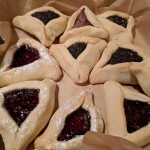 Hamantashen are eaten for the Jewish holiday of Purim. 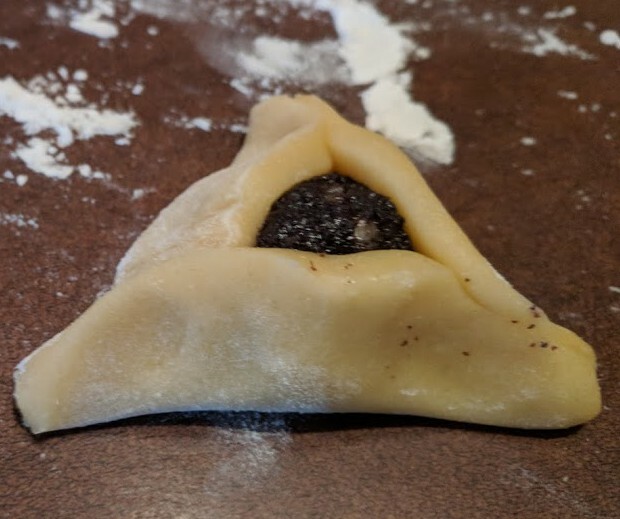 They’re triangle shaped cookies that were originally made with a poppy seed and honey filling. Nowadays, they’re also made with other fillings like different types of preserves or even Nutella! Purim is a holiday that celebrates the saving of the Jews from Haman in ancient Persia. Haman was an adviser to the king. He had planned to kill all of the Jews in the empire. His plot was foiled by Esther, Queen of Persia, and her cousin Mordecai. Mordecai had saved the king’s life. When the king learned this and the fact that Mordecai and Esther were Jewish, he stopped the plot. In the end the king had Haman hanged. An important part of the story of Haman’s defeat happens during a feast Esther has thrown. 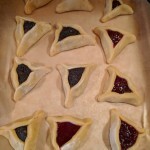 That’s why symbolically, eating Hamantashen represents the destroying of Haman through feasting. 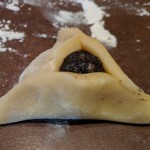 Many think the triangle shape of the cookie represents Haman’s three cornered hat. Interestingly, this is also why the Hebrew version of “My Hat it has Three Corners” is sung for Purim. “Tasche” means “pocket” in Yiddish. One translation of Hamantashen is “Haman’s pockets.” Some believe the cookies represent the money (from his pockets) that he gave the king to kill the Jews. The poppy seeds might also represent coins given for the same reason. 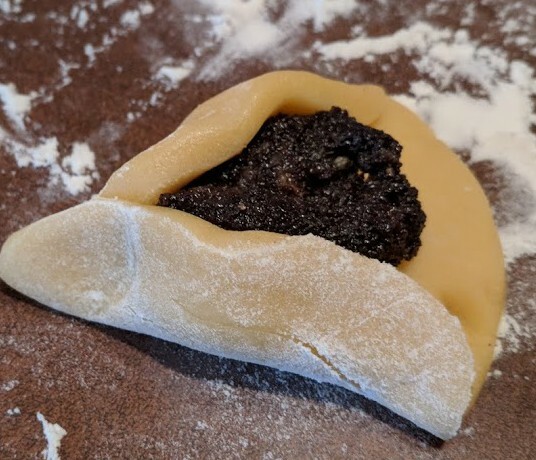 The Yiddish word “mohn” means poppy seeds. 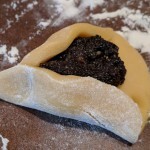 So מאָן־טאַשן (montashn) means poppyseed-filled pouches. 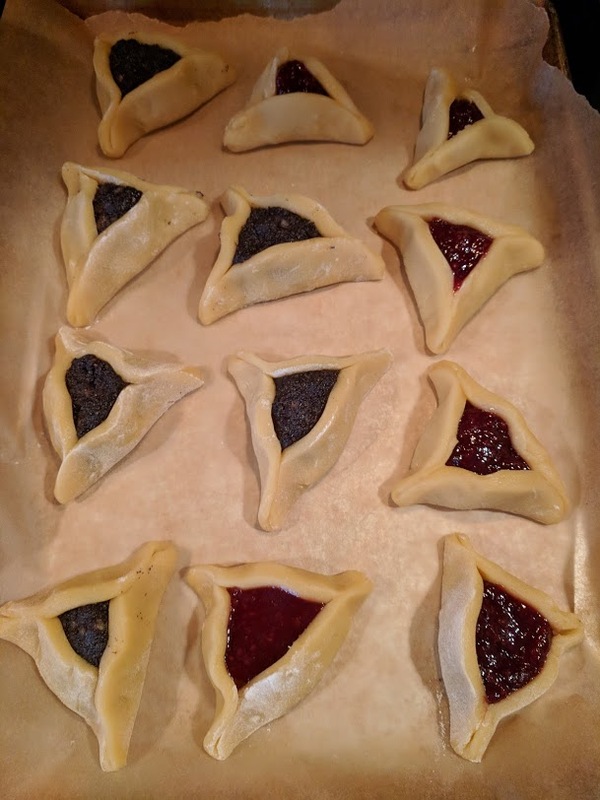 This transformed into hamantaschen over time to reference Haman. Poppy seeds are significant in the story of Esther. At first, she didn’t tell the king that she was Jewish. Since she didn’t have access to kosher food in the palace, she survived on seeds, beans and water. That’s why it’s a tradition to eat seeds for Purim. 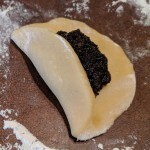 Here’s a delicious recipe for Hamantashen and the Poppy Seed Filling. If you’re not making the poppy seed filling, you can skip that part and instead use preserves, Nutella or even chocolate chips as a filling. 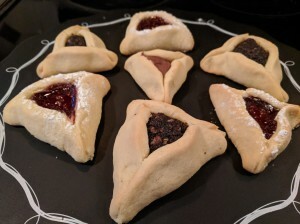 I made them 3 ways… with poppy seed filling, with Nutella, and with raspberry preserves topped with confectioner’s sugar. 1. 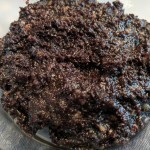 Grind poppy seeds in a grinder or place them in a ziploc bag and roll over them with a rolling pin to crush them. 2. Place all of the ingredients in a small saucepan. Bring to a low boil. Then simmer while stirring frequently on medium-low. 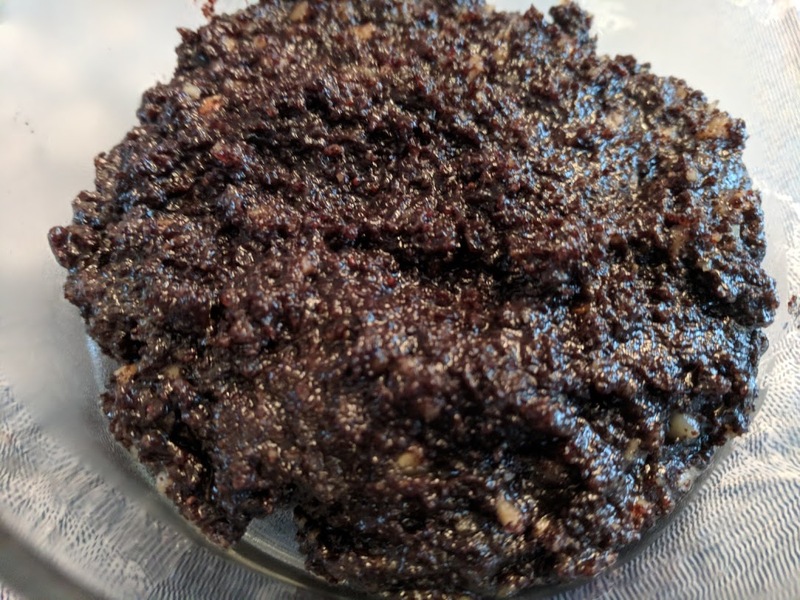 If the seeds don’t taste crushed enough, you can gently crush them more at this point with a potato masher (being careful not to splatter the mixture). 3. Cook, stirring all the time, until completely thickened. 4. Let cool completely before filling the cookies. 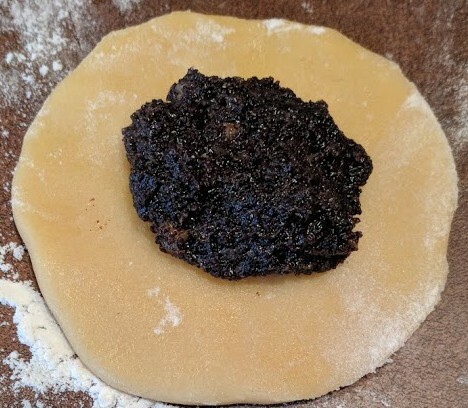 If making in advance you should refrigerate the filling. 1. Line cookie sheets with parchment paper. Preheat the oven to 350 F (175C). 2. Place the oil, eggs, vanilla and sugar in a mixing bowl. Using a hand mixer on medium speed, beat together for about a minute. 3. Beat in the baking powder and salt until mixed in. 4. Add half of the flour and beat until mixed in. 5. Slowly add in more flour. Beat in until you can’t use the hand mixer any more. Then knead by hand. 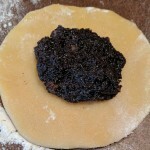 Add in the flour until you have a smooth dough that’s not sticky. I used all of the flour. 6. 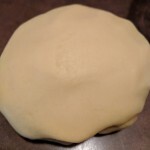 Roll out the dough on a floured surface until it’s about 1/8″ (.31 cm) thick. 7. Use a cup around 2 3/4″ in diameter (7 cm.) or a little smaller, to form circle shapes with the dough. 8. 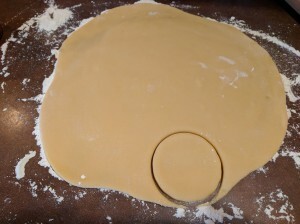 Place 1 – 2 teaspoons of the filling in the center of the circle. Don’t over-stuff. 9. Fold one “side” of the circle over part of the filling. Then fold over two more “sides” to make a triangular shape. The filling shouldn’t be totally covered with dough. Once you have the triangle shape made, gently pinch the corners of the triangle so the dough doesn’t come undone. 10. Place on the cookie sheets with an inch in between the cookies. 11. Cook for about 15 minutes until the cookies are just turning a golden color. Let cool for a couple of minutes. Then place on a cooling rack to cool off completely. 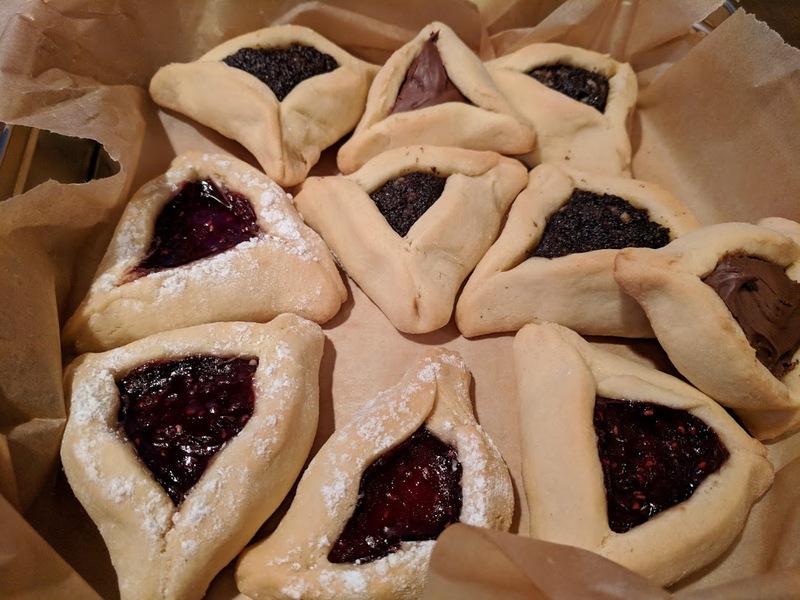 This article was posted on Saturday, February 24th, 2018 at 5:29 pm	and is filed under Cookies, Countries & Cultures, Desserts, Holidays Around the World, Israel, Jewish Cuisine, Languages, Mama Lisa, Purim, Purim Recipes, Recipe for Hamantashen, Recipes of the World, USA, Yiddish. You can follow any responses to this entry through the RSS 2.0 feed. You can leave a response, or trackback from your own site.